Environmental, social and governance (ESG) factors are being recognized in fixed income investing as value-added indicators of potential economic performance. In the latest edition of “Global Macro Shifts,” the Templeton Global Macro team outlines how it integrates ESG factors into its research process. 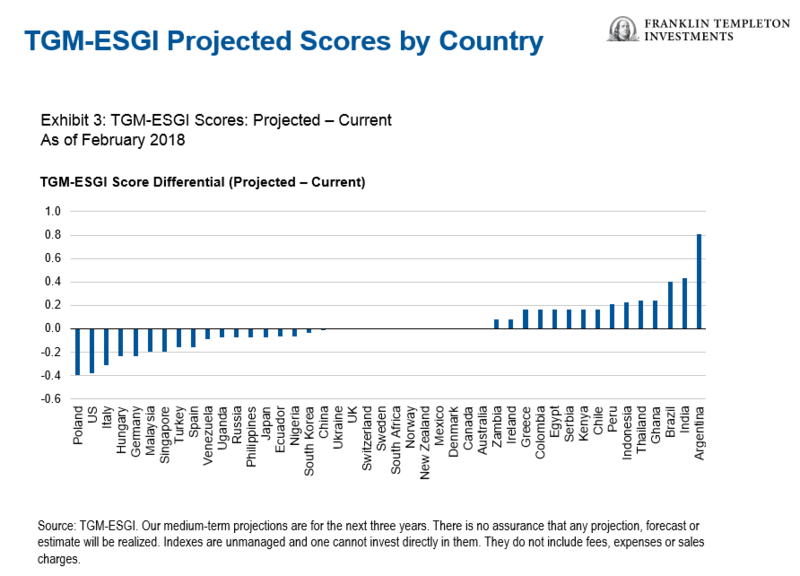 The team has developed a proprietary ESG scoring system called the Templeton Global Macro ESG Index (TGM-ESGI), to assess current and projected ESG conditions in various countries, and to facilitate macroeconomic country comparisons around the world. This document is a summary version of the full research-based briefing, which can be found in its entirety at the Global Macro Shifts homepage. Interest has also increased within sovereign governments, emphasizing the effect that ESG has on macroeconomic performance. This should not be surprising. Economists and historians have for a long time recognized and debated the importance of environmental factors and of social and political institutions for the long-term economic development of countries. Some of the early theories—going back all the way to Machiavelli in the sixteenth century—assigned great importance to the role of the environment, stressing that geography and climate determined the success of agriculture, the prevalence of diseases, and other determinants of economic growth. The role of environmental factors has been explored more recently by Jared Diamond in his 1997 best-seller Guns, Germs and Steel, and by Jeffrey Sachs in a 2001 paper (Tropical Underdevelopment, National Bureau of Economic Research). The quality of governance, and of political and economic institutions, plays a crucial role in macroeconomic performance, particularly in emerging and frontier markets. Robust governance contributes to the quality, stability and predictability of the policy environment and typically goes hand in hand with stronger potential growth, as well as greater resilience in the face of domestic or external challenges. It contributes in an important way to determining the risk of financial and economic crises. A new administration that has the ability to radically shift policy direction can be reason to enter or exit a market. Some governance factors such as corruption and attitude toward foreign investment also present large risks through political scandals and policy changes that complicate investments. We believe our approach has three key points of strength: (1) it has a comprehensive perspective, based on a careful selection of a broad spectrum of high quality indicators along with contribution from our internal research; (2) it provides a synthetic measure combining the different dimensions into a single numerical score that facilitates cross-country assessment; and (3) it has a forward-looking dimension based on our analysts’ forecast of changes in ESG factors. We believe this makes it more powerful than alternative approaches that are based on only a few, disjointed indexes, and provide merely a snapshot of current conditions. We employ a scoring system, in which countries are given a score from 0–10, with 0 being the lowest and 10 being the highest, to calculate a final ESG grade. The TGM- ESGI is constructed by overlaying the view of our research team upon a benchmark created from global indexes. To build our index we first canvassed representative and reliable indexes from reputable sources like the World Bank, the World Economic Forum and the United Nations. Our analysts then adjust benchmark ESG scores based on their proprietary country research and assign projected scores in anticipation of how these conditions will evolve in the medium term.2 This grading system rests to an extent on our subjective judgment, but we firmly believe it allows us to incorporate the insights of our research team and provides a rigorous method to assess underlying opportunities in a way that complements more traditional macroeconomic tools. Our ESG scoring includes 13 subcategories under the ESG groupings that we see as critical factors in measuring a country’s economic sustainability. Some of these categories do not have immediate implications but can have significant effects in shaping an economy in the medium to long term. We must also note the fluid nature of ESG measures. While we have clearly delineated subcategories for the purpose of scoring, these factors cannot be easily compartmentalized. This challenge must be overcome in any methodology that attempts to quantify ESG inputs. Current and projected scores are given individually for each subcategory and then averaged to attain a score for governance, social and environment. Within each of the three ESG categories, we assign equal weights to the 13 subindexes. We then calculate a final composite ESG score for each country with a weighting of 40% for governance, 40% for social and 20% for environment. The environmental factors receive a lower weighting because their impact on the economy often occurs over significantly longer time horizons than governance and social factors, as well as over longer timeframes than most fundamentally driven investment strategies. The TGM-ESGI then enters our economic assessment as an additional metric to complement our macroeconomic analysis and asset valuation assessment. We want to clarify that the integration of ESG into our investment processes does not imply we are forming value judgments on individual governments, social structures or environmental policies. 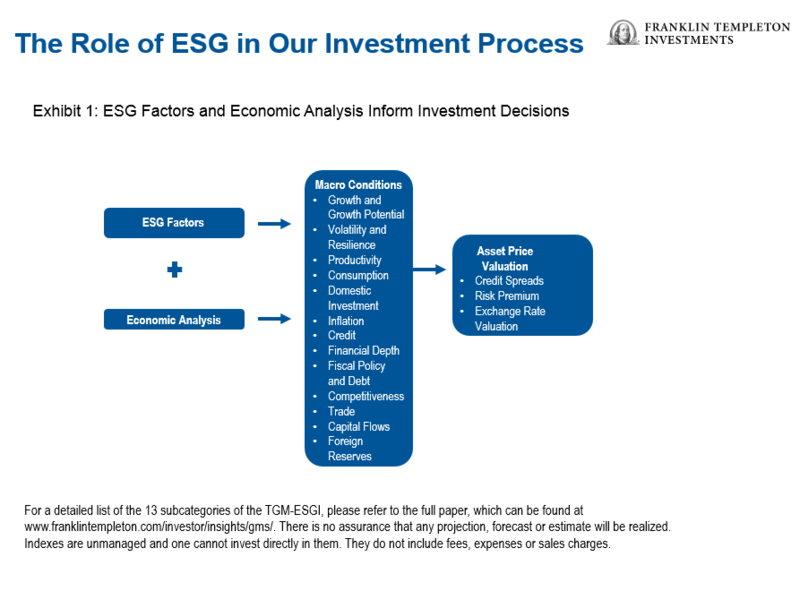 ESG simply serves as an additional tool to be used in formulating investment decisions based on financial considerations. Exhibit 2 shows the results of our scoring method for 44 countries. The grades range from a high of 9.2 for Denmark and Switzerland to a low of 2.2 for Venezuela. No country received a perfect score; the group that performed well on governance and environmental indicators did not always receive a high grade for some social subcategories, namely labor and demographics. 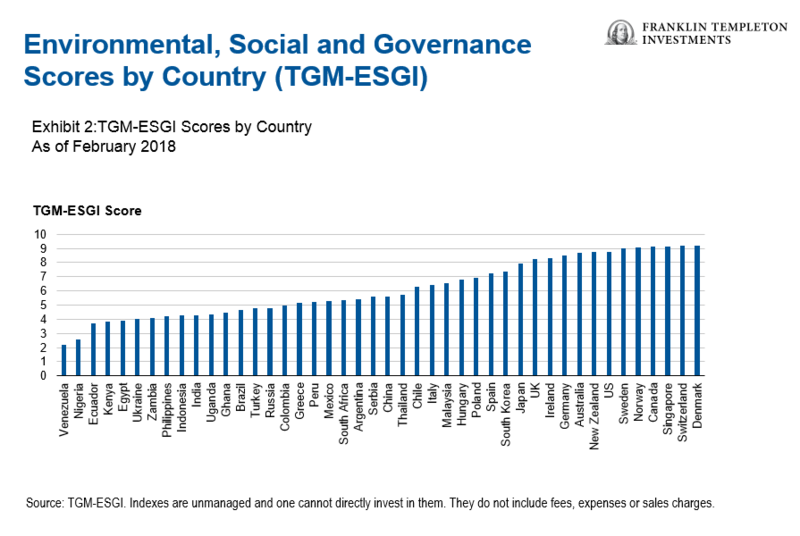 Our results show, as expected, that developed countries3 have higher ESG scores; developed markets have an average grade of 8.2 compared to 4.9 among emerging markets. Similarly, we see that ESG corresponds strongly with gross domestic product (GDP) per capita. The relationship between these two indicators appears to be exponential; the payoff of stronger ESG performance on income rises as scores increase. 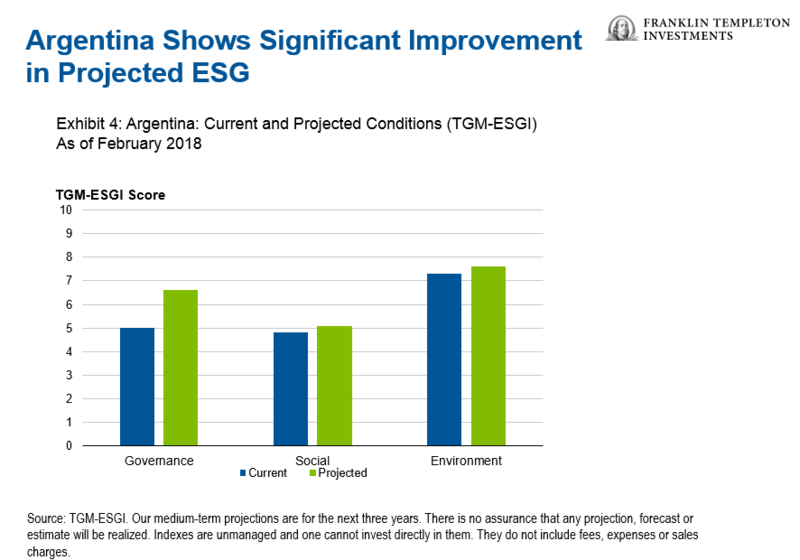 Argentina stands out as the country where we expect the greatest ESG score improvement (see Exhibit 4). Within the medium term we project its ESG score to rise 0.8 points from 5.4 to 6.2.4 Argentina was one of the wealthiest countries in Latin America, with a young population, a highly educated labor force and a strong agricultural sector, as well as abundant oil and mineral deposits. But after an economic crisis in the early 2000s, Argentina began a path marked by isolation from trade, government-controlled prices and unsustainable fiscal policy. The result was a falling current account surplus and declining national savings combined with lower productivity. The government also began to manipulate data to mask the incredibly high inflation that resulted from the central bank printing money to fund ministry of finance spending. Argentina never recovered to pre-crisis levels in terms of regulatory quality and rule of law. Similarly, corruption worsened significantly during the era of Kirchnerism, the specific strain of Peronism led by Nestor and Cristina Kirchner. Systemic corrupt behavior included nepotism in business contract allocation, unfair distribution of regional transfers from the central government and, as mentioned before, statistics distortion. Argentina became the first country to be sanctioned by the International Monetary Fund (IMF) for its data manipulation, particularly for inflation. Instead of allowing markets to set prices, the authorities used price controls and subsidies to artificially manage inflation; this resulted in a shortage of goods and underinvestment, turning Argentina from a net exporter of oil and gas to a net importer. The Kirchner leadership also worked consistently to undermine central bank independence and judicial power to check such behavior. As a result, Argentina’s rankings in the Corruption Perceptions Index by Transparency International increased significantly in the early 2000s and underperformed compared to regional peers like Brazil, Peru and Colombia. These dynamics began changing with the election of center-right leaning President Mauricio Macri in late 2015. In the past two years the government has launched a number of reforms to undo over a decade of damage. Notable achievements have included reestablishing de-facto central bank independence, clearing a significant portion of export and import restrictions, and embarking on a gradual path of fiscal adjustment. The government also floated the Argentine peso and adjusted the price of public utilities and transportation—tough decisions given the inflationary impacts. But the central bank moved capably to hike interest rates, and the government recognized it must enact policies necessary for long-term economic viability, despite the negative short-term consequences. 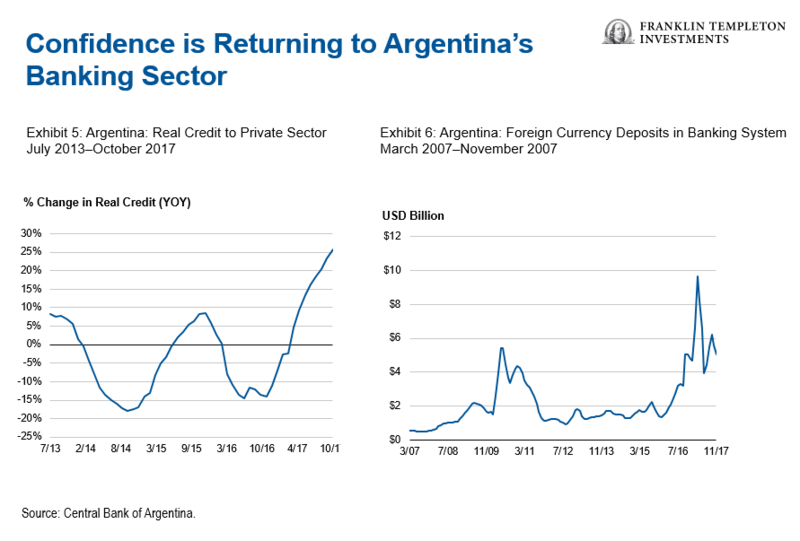 One significant move was the government’s decision to begin reducing fiscal transfers from the central bank, a practice that began during the Kirchner era to finance growing budget deficits. The government also set up an independent statistics agency to start providing reliable data again, and the IMF announced in 2016 that the country can be trusted to provide accurate inflation estimates again. We expect further progress. The government performed well during Congressional elections in October 2017. Not only did this victory result in stronger momentum for reform, but it also showed that the Argentinian population has turned away from the populist policies of Peronism, which dominated 20th century politics, in favor of a more orthodox policy approach. Government effectiveness should improve with the recent electoral victory, and we expect the policy mix to strengthen as the governing coalition continues to push forward reforms. Important issues on the agenda include tax reform to lower the corporate tax rate and a bill to improve labor market flexibility. These policy initiatives should help to improve competitiveness, encourage investment and lower unemployment levels. We also expect these reforms to begin to have a greater positive impact on economic activity. For example, Exhibits 5 and 6 show that real credit to the private sector and foreign currency deposits have already expanded significantly as confidence and flexibility returned to the banking sector. We are optimistic that this renewed financial activity has the potential to lift overall economic performance moving forward. ESG factors have started to be recognized in fixed income investing as value-adding indicators of economic performance; an increasing number of portfolio managers and investment specialists are now beginning to incorporate some form of ESG into their decision-making process. We have long seen ESG as an especially critical tool for evaluating long-term economic performance, and by extension prospects for sovereign debt value, as its components align naturally with our analytical approach based on political and macroeconomic fundamentals. 2. Our medium-term projections are for the next three years. There is no assurance that any forecast, estimate or projection will be realized. 4. Our medium-term projections are for the next three years. There is no assurance that any forecast, estimate or projection will be realized.